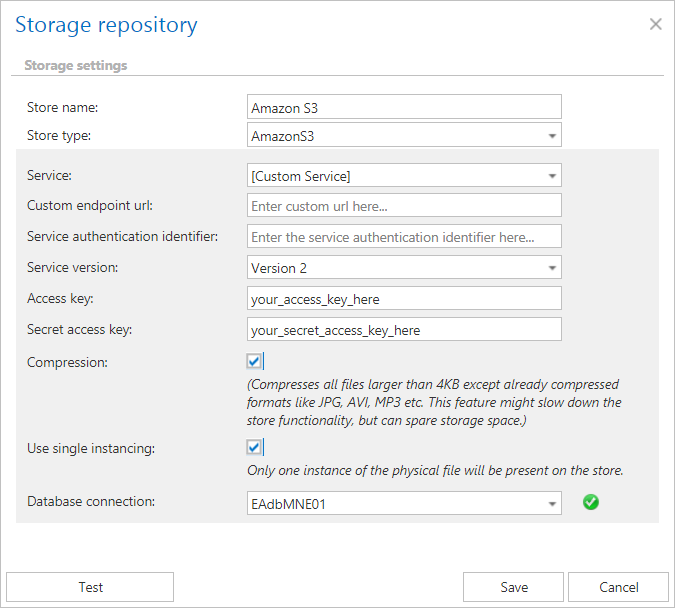 The Amazon S3 store supports any type of cloud storage if it’s using the Amazon S3 interface. The store connects to the endpoint that you select for a specific service. In contentACCESS, the service endpoints for Amazon Simple Storage Service and Alibaba Cloud Object Storage, which also uses Amazon S3 interface, are preconfigured. If you want to use a different cloud service, which supports Amazon S3 interface, it is possible to select Custom service URL for the service and then enter a custom URL for that service endpoint. The service authentication identifier is fixed for Amazon S3 and Alibaba, it’s not possible to change it. However if you are using custom endpoint URL, you can enter the identifier here. This identifier is used in the authentication request. The version specifies which communication version to use for the service enpoint (the service version is specified by the enpoint service). If you are using Amazon S3, you can use Service Version 2 or 4, but Alibaba supports only Version 2 at this moment. The Access Key and Secret Access Key are used to authenticate the caller by the cloud service. These keys are provided by the cloud storage service. This store type also supports compression and single instancing, which can save you a lot of space.